Solutionz by Chicke Fitzgerald : Anyone out there paying attention to Google ITA's OnTheFly Mobile App? Anyone out there paying attention to Google ITA's OnTheFly Mobile App? 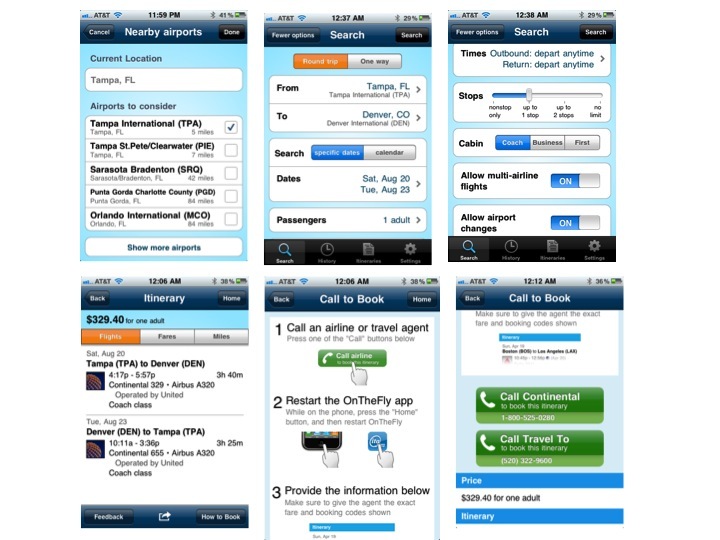 Posted on July 3rd to the iPhone App store, this little app is air metasearch on steroids - to go. One would expect that from the company that powers both Kayak and Bing, as well as a number of individual airlines. The app, which actually launched quietly last fall before ITA was acquired by Google, has SEARCH, HISTORY, ITINERARIES and a SETTINGS feature. 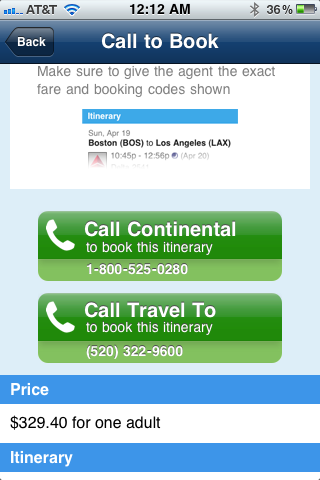 From the itineraries page you can look at your flights, the fare details and the mileage info. The search process uses ITA's QPX engine and is easy and the system retains your preferences and the itinerary. The calendar and the matrix are very nicely done. Now you can't book (remember Google has promised everyone that it would not become an OTA), but it does have a slick little "Call to Book" feature. The thing that I find interesting is that you can configure the App with your own travel agency or TMC phone number. Presumably this could also be an OTA phone number - paying for being listed perhaps? It also tells you the airline's phone number and gives you a one touch button to call them. You then get to "fare speak" to an agent, telling them the fare codes and the booking codes and passenger types so that they find the right fare. Good luck on that front. You can bet on the fact that this early iteration of this app is not their last. With the Google development team and no doubt boatloads of cash behind this, we can expect ITA to continue to tweak this product and I suspect we will see some private labeling of this product before long. You will notice that once you get into the app, there is absolutely no branding. This is either on purpose, to allow the app to be private labeled by others, or they let the tech guys design it and didn't let the marketing guys stop them from rolling it out.